Every once in awhile the eShop is greeted with an unusual game with a surreal experience that emphasizes the journey rather than the destination. These types of titles have only increased over the past few years thanks to the rise of smaller indie developers who have the freedom to create whatever they dream up. 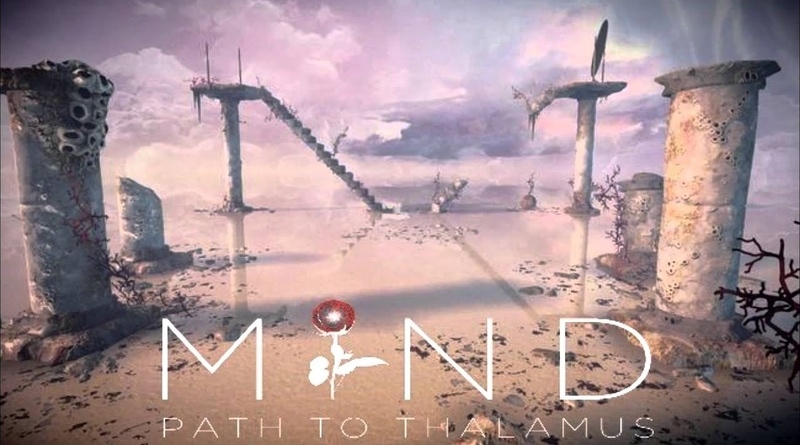 Mind: Path to Thalamus is no exception to this, with strange gameplay mechanics and beautiful vistas to discover. However, just creating something different doesn’t automatically make for a good game, and that’s exactly the sticking point here. The objective is to solve a variety of environmental puzzles in order to progress in its strange world. While the controls are as simple as you would expect, the puzzles in the game are not so much. A lot of them will require you to acquire an understanding of your surreal environment before you can even hope solving them. Some of the solutions are so obscure that you have no other choice but to try stuff until it works. In some ways this is reminiscent of older NES games that offered no rhyme or reason to figuring out how to proceed. One example is a section of the game where you fall through any staircase you step on, and you have to find invisible paths to proceed to the exit. The game has a ton of other challenging puzzles to go through, but that’s one of the few examples that’s easy to explain with how strange the environments of the game can get. One thing that stands out most about the game is how beautiful the world is. The environments are as surreal as they can get, and they fit hand in hand with the unique puzzle elements in the game. You have control over the weather so you can impact the environments around you. While the world itself is stunning to traverse, the way the puzzles mix into the surroundings makes you all the more invested in continuing on with your journey. It’s sad to say that one of the weakest elements of Mind: Path to Thalamus is its story. This is the sort of game where you are given very little plot and you must piece it together via contextual clues scattered throughout. While this medium of storytelling is desirable in some games, it just does not work here. Each level feels like a random puzzle that has no connection at all with the story given to you by the narrator. It feels like the story was tacked on as an attempt to add more depth to the game, but all it really does is ruin some of the immersion you had in the world of the game. The game is fairly lengthy, even if you do know the solutions for each puzzle. However, there’s little reason to play it again after completing it once. With how the game twists your brain in its surreal environments, it would have been neat for this game to have branching paths that led to different puzzles. The amount of content isn’t terrible for a game like this, but at the same time it isn’t as robust as one would like. As a piece of visual art, Mind: Path to Thalamus is an experience that will have you in awe. The game side of things isn’t as rosy, with trial and error gameplay and a very weak and tacked on story. If those aren’t important to you then this one is definitely one to consider.